Allah is the FIRST Who precedes everything, the LAST Who remains after everything ceases to exist; He is the FIRST with no beginning, the LAST and Everlasting with no end. Allah, the FIRST had beenexisting alone before His creatures’ existence; He is the LAST Who willcontinue to exist and annihilates His creatures and remain for ever andever, even after everything perishes. 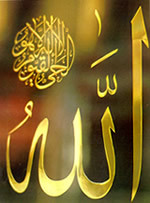 On describing something as (first) or (last) we mean first orlast with respect to something, and the two words are contradictory.Some religious Scholars said that Allah is the FIRST with respectto all existing things for He had been existing since eternity by Himself and all things befitted and derived existence from His Existence, He is the LAST with respect to behaviour for the knowledge of Him is the utmost degree of knowledge that can be perceived by the most knowledgeable of people. Everything known by the human mentality is but a step that can be a gateway to the knowledge of Allah, and to Him is the return of everything. He is the FIRST and the LAST for He is the Creator of the universe, with Him is the decision in the past and in the future. It is best to say that Allah is the FIRST and the LASTin an absolute sense; He rules all affairs from the heavens to the earth, in the end all affairs will be up to Him. No one can perfectly perceive the exact meaning and essence of the two names, the FIRST and the LAST exceptHim, the FIRST and the LAST, Glory be to Him, He is Allah. «(71) The ADVANCER (AL-MUQADDIM) (72) The DELAYER ..